Today I’m happy to introduce a brand-spanking-new meme and I hope you will join the fun! The ultimate goal is to discover books that we might have not noticed before, and the concept is very easy! Now here’s the book I choose! It was original released on October 1st 2008, and it really stands out from the masses. I choose Graceling by Kristin Cashore. The heroes, Katsa and Po are truly amazing and their passion and determination shines through the pages, and I promise your heart will skip a few beats a couple of time in this action filled fantasy novel. Everyone who’s read that book after my recommendation liked it so I’m daring you to give it a try! To celebrate the birthday of Daring You To Read… I’d love to offer the participant of the first two weeks a chance to win a surprise book! All you have to do is write your own DYTR post, adding your link to the linky and enter fill the rafflecotpter form! I loved Graceling. I thought it was amazing. So glad that I read it after reading your review. Tynga - Graceling is one book I've been meaning to read, yet haven't yet. We have it in our school library, so I should give it a go. Also, I've tried to enter the giveaway, but can't seem to do it - I'm a follower (for a long time), I did my post on the meme! (fun) and posted about the giveaway. Help! :) I'm not very computer form savvy. Graceling and the rest of the series are fantastic. These are very good reads with very intelligent story lines. Hello Mardel! To enter the giveaway you have to fill the Rafflecopter form (which doesn't load on google reader so you have to actually visit the blog). You have to first enter the mandatory entry did clicking "I did this" Enter your name, Email & link to your post. Once you've done that the additionnal entries will unlock and you just have to follow the instructions. Let me know if you still can't do it. I'm listening to Fire, the second book right now and I'm loving it. I haven't read Graceling yet, but I plan to pick it up next. I just read this last month and it was really fun! I bought Fire last week. Thanks for the recommendation, I'll put it on my list. Tynga, I really like the sound of this new meme and will introduce me to a lo of new reads. Here's mine: Daring You To Read: Cover of Night by Linda Howard. Luckily I just bought Graceling today (in Hebrew)so I going to read it soon! Great idea for a meme - love it! @Hanna I should really reread it! Tynga - I think I figured it out, finally. I was on your blog (not the google reader) and STILL couldn't do it - I didn't realize that I had to actually click on the now obvious to me green buttons. LOL - That's what I mean by not being very computer friendly - there are little things I don't notice sometimes. LOL. So I finally entered, thanks. 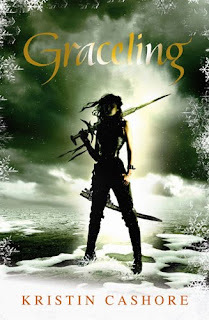 I also meant to say, that I like the new version of Graceling's cover. It's different than the copy we have in our school library. *SQUEE! * Darling this is such a wonderful idea!!!!!! Would me making a post tomorrow be too late? I've been busy all day and yesterday with midterms etc :(. *HUGS! * I looooove it!!! Definitely will participate next week!!! I finally got a chance to get my post written and up. Woohoo. And I'm so sad: my library doesn't have an audiobook version of Graceling. I was so hoping it would. How can they have an audiobook version of only one of the books in the series? Boo. Sara- Graceling & Fire were published with different publishers, that might be why. Will have to check this book out! I like the idea of this, Tynga! I've heard a bunch of great things about Graceling, and I've owned a copy of it for a long time, but I still haven't gotten around to reading it. I need to pick it up soon! I really do like how you specify that we should choose a book that has been released at least 6 months ago. It's a great way to stir up some buzz for titles that we missed out the first time around! Great new meme! It's so excited to revisit the books we love and not just the ones we're looking forward to reading.